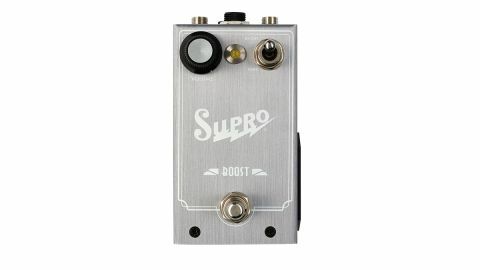 As boost pedals go, Supro’s Boost offers something different from the norm. Worth checking out. Knob design could be better as the white position markers are hard to see. With its amps having a certain cachet, not least a Jimmy Page connection, it was no surprise that the Supro name was revived recently by the people behind Pigtronix pedals. The resulting series of new amps has quickly gained respect and one of their designers, Thomas Elliot, has now put his expertise behind a new range of Supro pedals, the first three fruits of his labour being these Drive, Fuzz and Boost pedals. Today, we’re look at the Boost. The pedal is workmanlike rather than boutique-slick with solid, if rather tall, brushed aluminium casing. It runs from a standard nine-volt power supply but can also take 18 volts for extra headroom. It can also run from a battery that is housed in an easy-access slide-out plastic tray on the pedal’s side. Another neat feature is that it has a socket to take an expression pedal to control one specific parameter. The large toggle switch seen on the front of the recently-reviewed Drive pedal makes an appearance in the Boost pedal, too, but here it delivers different flavours of EQ. You can have a completely flat sound or bring in one of two 3dB/octave filters to tailor the 20dB of boost available from the single knob. The Bright setting is a high-pass filter that rolls off some bottom-end for more perceived sparkle. The Dark setting is a low-pass filter that tames the high-end if you’re looking for a warmer sound, maybe from particularly spiky single coils. With unity gain on the Volume knob coming at around 11 o’clock, there’s no sound at all fully anti-clockwise, so you can also use the pedal as a mute switch; if you plug in an expression pedal, you can use it as a volume pedal. User-adjustable minimum (set by an internal trimmer) and maximum (set by the volume knob) settings give you full flexibility, so you can have conventional volume swells or a set range of boost under foot-control. As boost pedals go, Supro’s Boost offers something different from the norm: there’s plenty here to drive your signal harder, but those tonal options and the volume pedal capability add an extra dimension.